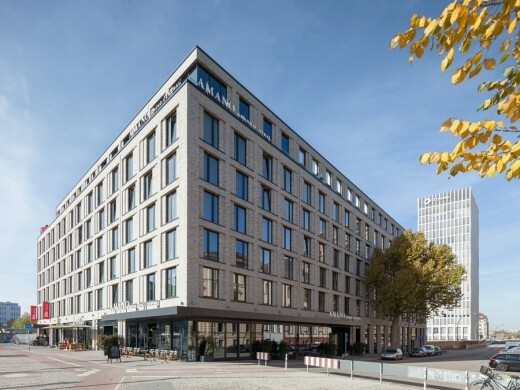 The two new hotels, IBIS (2 stars) and AMANO (3 stars) were recently completed around the Berlin´s Hauptbahnhof. 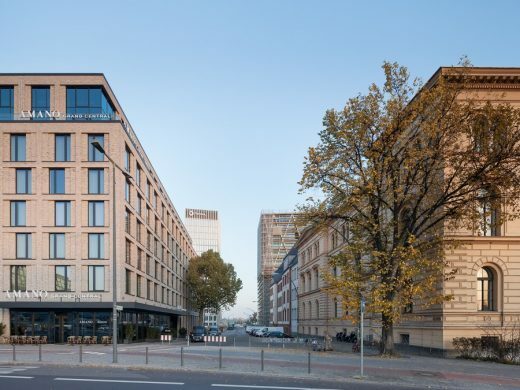 With its location, Europaplatz to the east and the square of the Berlin´s main train station to the north, these two buildings are perfectly connected to the public transportation system. Within the walking distance the most important cultural spots and vivid districts of the capital are easy to reach. Positioned on a mainly glazed base, the design of the 6-storey buildings becomes a part of the large-scaled block structure of the surrounding area. 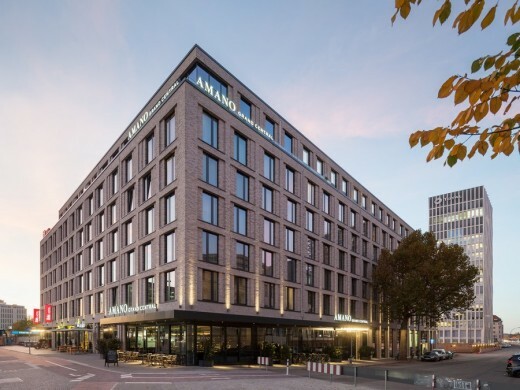 With its stacked storey, the top part of the Amano hotel is largely glazed, which allows a wide view over the city, whereabouts the IBIS hotel is covered with room-high slit windows. 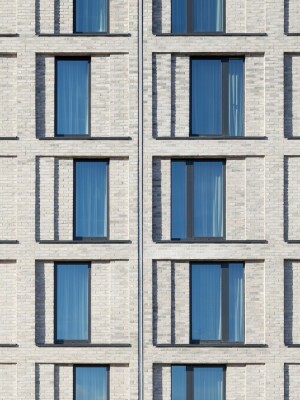 Clad with shimmering beige-grey coloured bricks, the main facades of the ensemble have only subtle differences in their form. 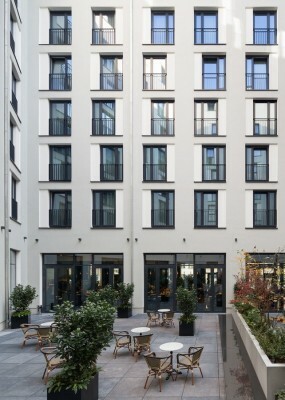 Within the strict and clearly gridded exterior, the architects focused mainly on the design of the window cladding which has, while looking at it, delicate movement elements and evoke a slight impression of pilasters. In addition to this, various windows are integrated in a horizontal shifting structure and each of them has its individual window scales. With the help of these précised details the grid obtains much more contrast and intensity. In the court yard, the architects used a similar approach by applying grater plaster cladding in beige-ochre colours instead of bricks. 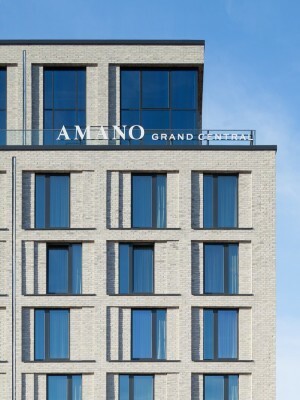 With its 250 rooms, the Amano hotel offers gastronomy and conference spaces on the ground floor. Its neighbour building IBIS hotel on the other side offers 295 rooms as well as retail spaces and gastronomy on the ground floor. The underground garage on the base floor provides besides 59 parking lots 72 bicycle parking spaces. Completing this variety both hotels are housing additional retail and gastronomic establishments. 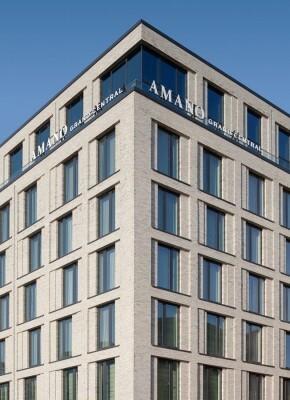 Amano hotel includes 6 barrier-free and 18 handicapped-friendly rooms. 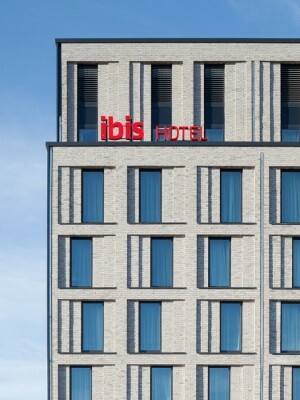 IBIS-Hotel provides 12 barrier-free and 21 handicapped-friendly rooms.